This should not take as long if these guides are made closer to the people who need them – close to hospitals, for example. But how can this become a reality? A mobile factory called CassaMobile is the answer. 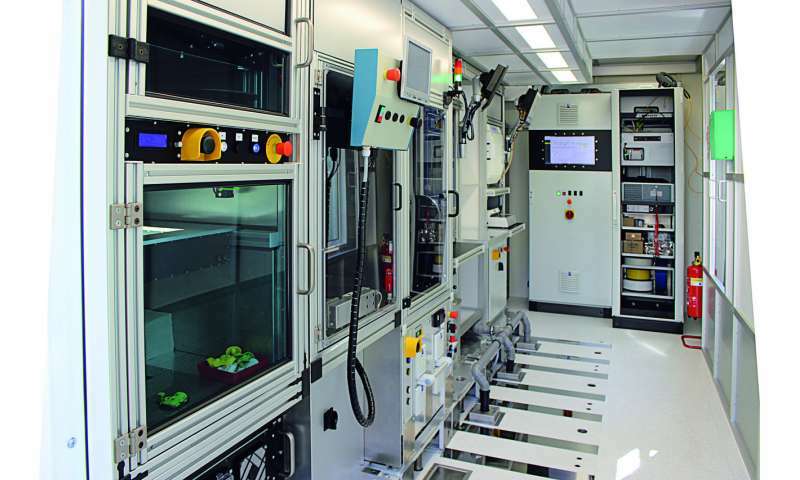 Led by the Fraunhofer Institute for Manufacturing Engineering and Automation IPA, 12 European companies and institutes developed this mobile production facility in the scope of the EU's CassaMobile project. Fraunhofer IPA supplied the idea and the concept. "This mobile factory can reduce a delivery time of up to a week to just two days," says Raphael Adamietz, IPA's CassaMobile project manager. The Italian term "CassaMobile" refers to an ISO freight container. The exterior of the green and white container seems nondescript. But first impressions can be deceiving: Its interior boasts a smart mini-factory. This mobile unit can be used, for example, to 3-D-print bone drilling guides and rework them in a milling machine before verifying their quality and sealing them in sterile packaging. A CassaMobile container allows customers to manufacture tailor-made products very quickly virtually anywhere. This is possible thanks to the researchers' commitment to a modular design. It is easy to modify or expand the supply chain. Users can also omit individual modules, if desired. This makes it possible to deploy the mobile factory to disaster areas after earthquakes, for instance. Specialized response teams on site can then use a CassaMobile to produce items critical to restoring the supply of drinking water, for example. These containers could also benefit regions in which factories are unlikely to be erected due to a lack of sufficient infrastructure and suitable structures. By contrast, a CassaMobile is a standalone infrastructure. Another potential use is the production of something in short supply: spare parts for motor vehicles in Africa, for example. 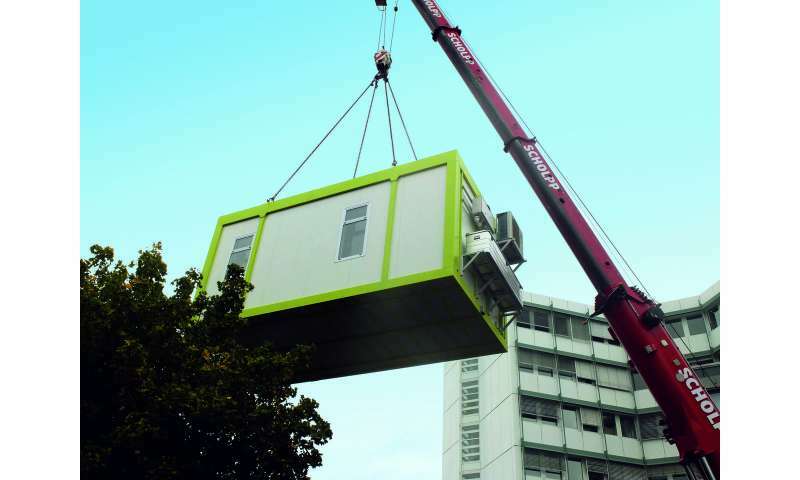 The most important module of this portable plant is a 3-D printer developed by Fraunhofer IPA. "We combine two materials for printing. We typically use polyamide for the part itself. And for spots where we ultimately want no material, we use a support material that we remove afterwards in a solvent," explains Adamietz. Researchers can thus rely on free forming to manufacture three-dimensional structures. The material used for printing is supplied as a roll of plastic cord, which is dissolved and placed in lines on the substrate. The researchers heat the assembly space too so that the surface remains homogeneous and the part is true to size. A camera monitors the printing process throughout and helps remedy any errors at once – reducing scrap, improving quality, eliminating the need for time-consuming manual checks and ultimately ensuring that the parts produced are dimensionally accurate. Even if surface quality is ever less than perfect, a milling module can be used to rework the part. What if a product, such as a bone drilling guide, must be sterile? A CassaMobile user can wet-clean the product, sterilize it with steam and package it to ensure sterility. To guarantee that the air inside the container is and remains pure, the air is continuously circulated and put through air filter units that remove any impurities. Last but not least, a central computer connects all the components and controls the entire production system.